How to memorize PMP® ITTO? – One of the most Frequently Asked Question I get while talking to professionals preparing for PMP® exam. I observe that PMP® ITTO is one of the main reasons of exam fear and become the cause of delaying the exam date. In this blog, I am addressing ways to overcome the fear by giving tips on how to learn PMP® input-output. What are ITTO in the PMBOK® Guide Sixth Edition? How many direct ITTO questions come in the exam? Should I develop my own Input Output Diagram? 1. What are ITTO in the PMBOK® Guide Sixth Edition? In the PMBOK® Guide Sixth Edition, ITTOs are the basic building block of all 47 processes. These are the components of a process and understanding of these processes gives you a solid foundation for executing your project. What are the input in ITTO? Before starting activities of a process, you need to think all the pre-requisite items which facilitate the creation of the output.Let’s suppose; you are planning to develop a plan for your project requirements and scope. For that, you are thinking what existing organization templates (Organization Process Assets) can help me, what is the organization culture (Enterprise Environmental Factors) I need to take care in identifying stakeholders, and what are the guideline for the approaches (Project Management Plan) of developing my Scope and Requirement Management Plan. 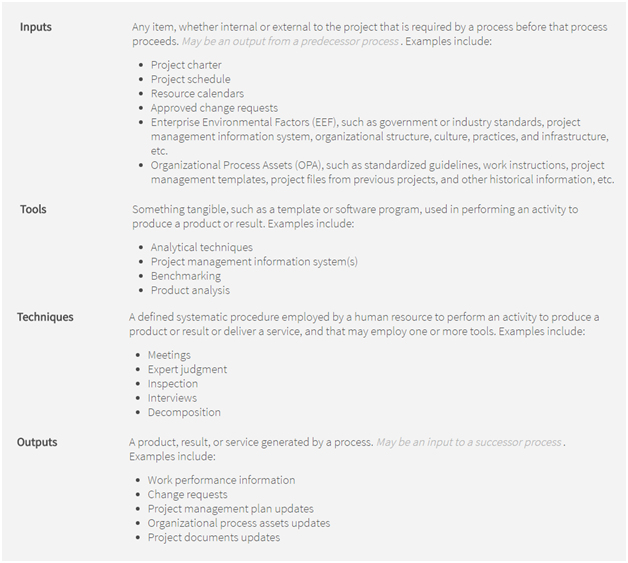 And finally, what are the initial requirements (taken from Project Charter) which can be used to detail the Scope and Requirement management plan.All of these items are Input in ITTO, as all of these items support you in developing the Scope Management Plan and Requirement Management Plan. What are the Tools and Technique in ITTO? After consideration of input, the next step you take is to carry out activities involved in the process. In your developing Scope and Requirements Management plan example, you meet with identified stakeholders and take their expert judgments. 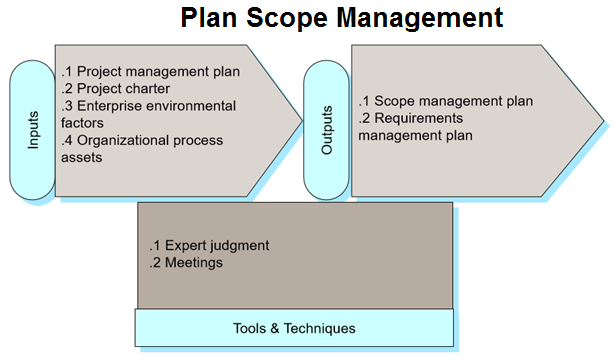 Here Expert Judgment and Meeting is the Tool & Techniques for producing your Scope and Requirement Management Plan. What are the Outputs in ITTO? Outputs are the result of transformation on selected inputs using application of Tools & Techniques. During meeting with your stakeholders, you take their opinion and produce the scope and requirement management plan and serve the output of developing scope management plan. 2. How to memorize PMP® Inputs and Outputs? Each process of PMBOK® Guide Sixth Edition has on average seven ITTO per process, and it makes around 300 total ITTOs. This number scares many of you; let me give you the good news here. You are required to learn much less number of these ITTOs. Most of the Input, Tools & Techniques, and Outputs are commonly used throughout PMBOK® Guide Sixth Edition and PMP® certification trainings. All you need is to become fluent in these commonly used ITTOs. The PMBOK® Guide Sixth Edition also helps you in learning these ITTOs. The ANNEX A1 on page number 417 gives you Knowledge Area Overview figure, and ITTO & Data Flow Diagram of each process. It is a great tool for those who are visual learner. Here I am presenting some of these ITTOs which are repeatedly used throughout PMBOK® Guide Sixth Edition. Expert Judgement: To meet the goal of a process, whenever you engage your stakeholders most of the time you are taking information for what they know (Expert Judgement) about the topic under discussion. In PMBOK® Guide Sixth Edition, Expert Judgement is most commonly used in planning processes. Project Management Information System: (PMIS): In PMBOK® Guide Sixth Edition, the PMIS represents access to tools for collection & distribution of information, and interfaces to other online automated systems. It is also considered to be an Enterprise Environmental Factor, as it comes from the organization environment and influence the project execution. It is a valuable tool to know for many PMBOK® processes. Updates: The updates in the Project Management Plan and Project Documents are typical output in many planning, execution, and Monitoring & Controlling Process. You may observe these updates throughout the PMBOK® Guide Sixth Edition. 3. How many direct ITTO questions come in the exam? Only a few direct questions come on direct ITTO part as PMI focus on conceptual understanding. You need to give emphasis on the understanding of the relationship between Input, Output, and Tools & Techniques. If you want to overcome the fear of these ITTO, you need to focus more on understanding why a particular ITTO is used in a PMBOK® process. It will not only support you to attempt pure ITTO based questions but also give you a better understanding of concepts to crack scenario based questions in PMP® exam. 4. Should I develop my own Input Output Diagram? Your creation may support in a strategy which works for you. You can create your ITTO chart to understand better the flow and relationships of Input, Output, and Tools & Techniques. Alternatively, you may download the following sheet which covers Input, Tools & Techniques and Output of all the 5 Process Groups and 11 Knowledge Areas. This sheet will help you to discover ‘What’ you are required (Input), ‘How’ you will achieve the process goal (Tools & Techniques), and ‘What’ you want to make (Output) from the process activities. In Summary, understanding ITTO by their interrelationships instead of memorizing all of them will remove your exam fear. Learning PMP® ITTO is an important activity and a Study Plan will also help in passing the exam without unnecessary delays. iZenBridge offers a PMP® Online training program which gives you complete assistance throughout in your certification journey. We offer complete study materials, audio visual training support, live webinars, and 24/7 trainer assistance. As per PMBOK® fifth edition there two reports are Performance report and Status Report. Work performance Information is termed as progress report. Status reports inform stakeholders about where the project is today in regard to project schedule and budget. It also describe what the project team has accomplished to date. This might include milestones completed to date, the percentage of schedule completion, and what remains to be completed.